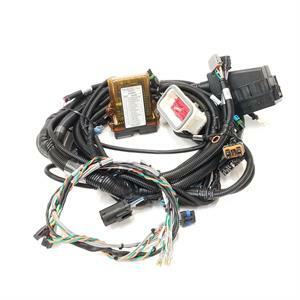 Freightliner Harness Kit-07 Cascadia Detroit Series 60 DDEC5 with Processor and Dash Harness for Sale. Detroit Engine Control Harnesses for Peterbilt-Kenworth-Freightliner and International for the installation of non-current production Detroit Series 60 engines in Peterbilts-Kenworths Freightliners and Internationals . Kustom Truck can supply you with an OEM quality plug and play harness for the installation of a Detroit DDEC3, DDEC4, DDEC5, DDEC6, Series 60, 12.7L, or 14.0L engine that require no modifications or reworks. In addition to the harness, we also have an excellent tech support group to help you with tech support during installation. To spec and purchase your next Detroit Engine Control Harnesses for a Peterbilt-Kenworth-Freightliner or International with Detroit 94 to 07 Platform EPA engine in your next Kenworth-Peterbilt-Freightliner or International call toll free 1-888-564-8890.